Click the button below to add the M4-33 Angels in the Round Medallion | 33x4 to your wish list. We used this medallion as a back lighted wall art project and it couldn't have turned out better. It really helps that it is carved out in the back and has a hemp filler to add the strength needed for our use. The bad: The large center hole cut was not expected; it exceeded the width of fixture adhering. No hole was pictured. The great: Everything else was perfect. Quality look, feel, finish. 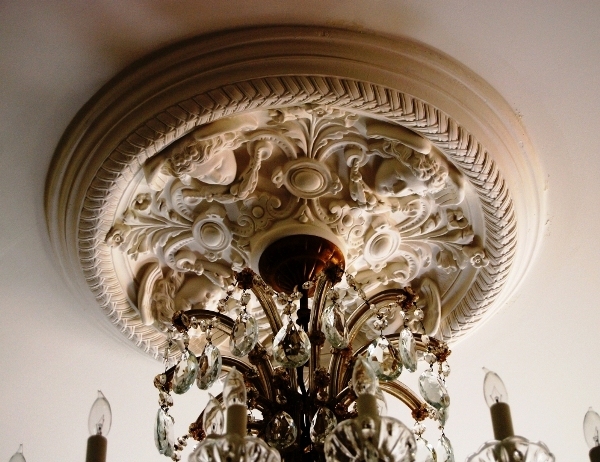 Overall workmanship worthy of any chandelier, regardless of price. Installing in a new transitional home with a 39h x 44w transitional murano glass chandelier. Plan to order matching angel shelf(s) for use in bathrooms. Medallion compliments nice decors. We ordered 7 plaster medallions from Castle. All arrived quickly, well packed and were of very high quality. Easy to install and look terrific in our historic Greek Revival home. Highly recommended.